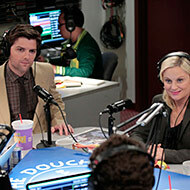 Awesome: NBC is giving early renewals to Thursday comedies Parks & Recreation, Community and The Office. 30 Rock was renewed earlier this year, and The Office was a no-brainer. But the pickups for Parks and Community means fans won’t have to suffer another six weeks to find out the fate of the shows. New NBC chief Bob Greenblatt had praise for all three: “The Office continues to fire on all cylinders on the most competitive night of television; Parks & Recreation has come into its own this season as the rightful companion to The Office; and Community is one of the freshest comedies on any network and a solid foundation for Thursday night.” We agree. UPDATE: We e-mailed Parks co-creator Michael Schur about the renewal. He very cleverly responded with an answer designed to make sure you watch this evening’s new episode. “My reaction was similar to that of Ron Swanson when seeing Li’l Sebastian in tonight’s episode,” he told us. If you can’t wait that long, Schur offered another metaphor to describe the level of his happiness this afternoon: “I’m as happy as Ron Swanson at a ribeye-eating contest,” he said.